Typically, this is considered a childhood illness, and it doesn’t generally have any negative lasting effects on children when they get it – although it is certainly not fun to deal with at the time. However, chickenpox has the potential to be very dangerous for women who are pregnant, as well as newborns, and teens and adults who have not had chickenpox in the past. If someone has issues with their immune system, it can make it even more dangerous for them if they were to contract chicken pox. Even though it might not be a dangerous condition for children, they need to stay home if they have chickenpox. Otherwise, there is a very good chance that they will infect the other children they encounter. In most cases, people who have chickenpox are unlikely to get it again. However, there is the potential for the virus to become active once again. If this occurs, it can cause shingles, which is a type of viral infection. Unfortunately, chickenpox can spread very easily. It will spread if someone coughs or sneezes, if a person touches fluid from one of the blisters, or if they share drinks and food. Even before symptoms appear, it is possible for a person to start spreading chickenpox. In fact, it seems to spread more easily in those early days before the rash appears. Those who have never had the illness and who have never had the vaccine are at risk. Spotting chickenpox in the early stages can actually be quite difficult. In the earliest stages after contact with someone who has chickenpox, there will not be any symptoms, even though the virus is building in the system. Soon though, they will start to feel ill. They may have a fever, and they will have a diminished appetite. Some will also suffer from a sore throat, a headache, and a cough. After the appearance of the first symptoms, the red rash and spots will begin to appear. This generally happens a day or two after those initial symptoms. The spot will become a blister, it will burst, and then it will crust over as it dries. New spots will continue to appear on the body for up to a week, and sometimes a bit longer. In most cases, it will take about ten days after the first symptoms to the point where the child is again healthy enough to return to school. Most of the time, both adults and children who suffer from chickenpox are able to be treated at home. The treatments tend to be very simple. The individual needs to have rest, and they should be taking medication that will help to reduce the fever, as well as to reduce the itching. It is very important that your child does not scratch the chickenpox rashes and blisters, as there is a potential there for scarring if not careful. Utilizing anti-itch remedies is very important for this. Some will even use oatmeal baths as a way to ease the sensation of itching, which can become overwhelming. Those who have issues with their immune system though may need to seek professional medical treatment for the chickenpox. For example, they may need an antiviral medication, which needs to be prescribed by the doctor. 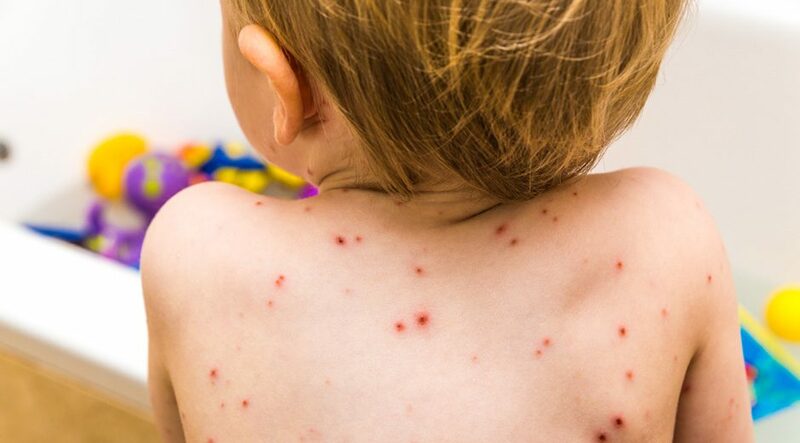 For anyone who is at risk with chickenpox, as mentioned earlier, it is a good idea to speak with a doctor as soon as they believe they are coming down with the chickenpox. Dealing with the chickenpox is no fun at all, but for those who have not had their vaccination, it is a very real possibility. Take precautions by scheduling an appointment for your vaccination, provide the necessary rest for the body to start to heal, and it is possible to handle the chickenpox with minimal complications. Parents should keep in mind that if their children have chickenpox, it likely means they will have to take some time off from work to care for them. Getting an early vaccination can prevent this problem.